My husband and I had wandered over to the frozen harbour during an outing on January 28, 2018 to see if we could find the visiting Snowy Owl. Our attention was diverted by a couple looking at a dark object on the ice, not far from the stone harbour wall. It was a muskrat, looking a bit lost and not moving much. Muskrats have been observed out and about this winter in the park, sitting on ice shelves and eating zebra mussels (a surprising number of species of birds and animals have adapted well to eating the invasive bivalves, thankfully), but this one was alone and appeared weak and listless. A few more people came by to have a look, including friend and fellow birder, David Creelman. He and I discussed whether we should call in wildlife rescue; we parted soon thereafter, and then David decided to initiate a call to the Toronto Wildlife Centre, a non-profit organization dedicated to the rescue, treatment and rehabilitation of urban wildlife. 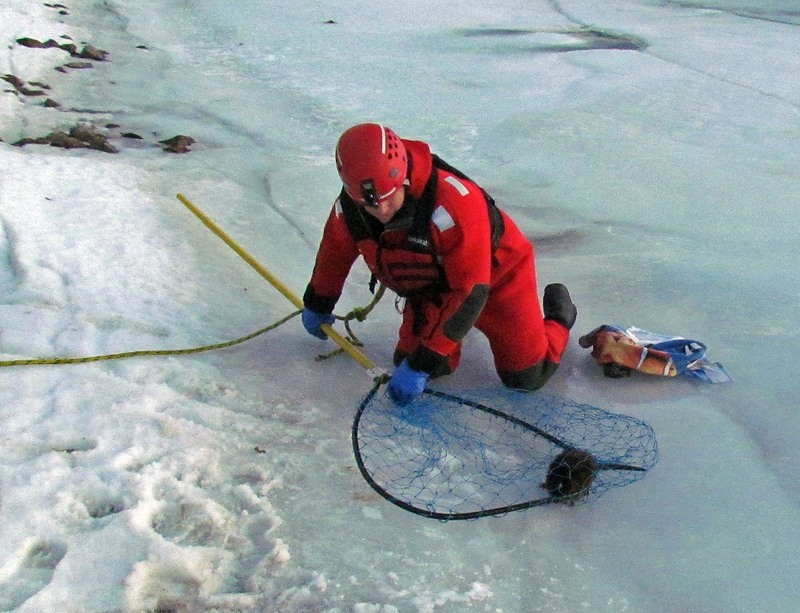 There are several Toronto Wildlife Centre (TWC) rescue staff members who are trained and certified in ice rescue, as well as swift water rescue, and chemical immobilization. 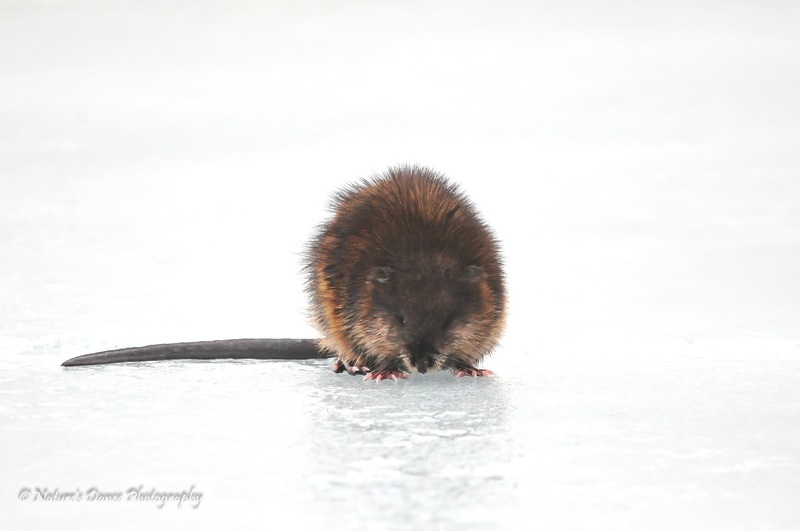 That first skill was called upon that day, as the muskrat was sitting out on rather precarious ice, too dangerous to support human weight. Fortunately, rescue team member, Sarah, who has years of animal rescue experience, was able to accomplish the rescue with the help of an ice suit, safety line and a long-handled net (see their dramatic video of the rescue here). The little muskrat was then rushed to the TWC, where medical staff took over. The animal was hypothermic, dehydrated, thin and very weak. The skilled medical team did everything they could for little "Muzz" (as dubbed by David), but he sadly passed away. 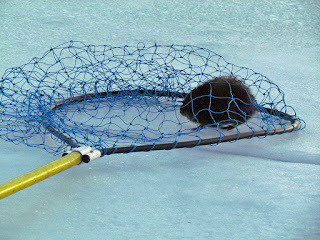 In a Facebook post about the rescue and attempts to save the muskrat's life, the admin stated: "We're sad we couldn't save this patient, but there is some comfort knowing he didn't freeze or starve to death slowly on the ice, and that many wild patients here at TWC are saved each day with the support of our donors. If you see a wild animal stuck on a frozen body of water, please do not attempt to capture it on your own. Contact TWC at 416-631-0662 from 9 a.m. to 6 p.m., 7 days per week!" 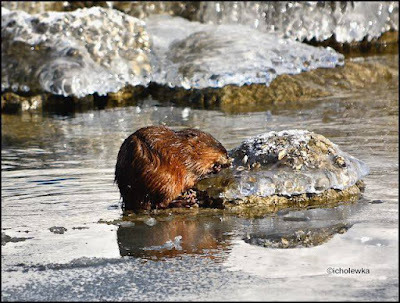 See Brian Bailey's great video of a muskrat chowing down on zebra mussels, from the Friends of Sam Smith Park page.